The "little St Sulpice" !!! i thought it was marvellous in your original photos. Can you tell us how much space it takes? Everybody is invited to test my organ, when he will visit Germany/Bochum. People have asked what type of computer (singular) will run it - there's no reason why it can't have, say, four computers each running Hauptwerk playing a different department of the organ. What system are you using to generate the MIDI? It's an absolutely beautiful instrument. I salivate like one of Pavlov's dogs everytime I look at the photos. for two open days in my home at Bochum, Germany. It’s only a private and non-commercial event (I don’t have anything to sell), for an exchange of information. You can play, listen or discuss. As it’s my private address in Bochum/Germany, I don’t want to make it public in this forum. Please send me an Email to joerg[dot]glebe[at]thyssenkrupp[dot]com with a short (preferring binding) acceptance (date and approx. time, number of persons), then I will give you my address, telephone number and the route. My wife will care for soft drinks and food. Questions will be answered by email. Attached you find some new pictures of my console and the prospect. A beautiful console & case! Thank you so much for your generous invitation into your home to enjoy your beautiful installation, and to participate in the first of it's kind "Hauptwerk Fest"! It's a bit to far for me to travel, but what a wonderful idea! Have a great time for all who can attend. Last Saturday, we (Ariaan Hoogendijk, Gert van Ginkel and Wim Eradus) visited the first open day of Joerg Glebe. Thanks to our Tom-Tom navigator, we found the address in Bochum without any delay. Joerg presented the 4 manual organ, specially built on his specifications. Wooden keys, made very long to achieve mechanical mass inertia, together with magnetic "valve", guaranteed an optimal touch, especially for playing baroque music. The computer, hided in a cabinet, used a quad-core Extreme QX6700 and 8 GB memory. A large amount of high quality speakers, 10 Genelec 8050A broad band and one Genelec 7070A subwoofer, lowest frequency 19 Hz, were placed behind the glossy façade pipes. The first loaded sample-set was the Gottfried Silbermann organ in Reinhardtsgrimma (OrganART Media). Joerg presented also the Bosch/Schnitger, Vollenhove and the Ducroquet/Cavaillé-Coll, Aix, from the same producer. 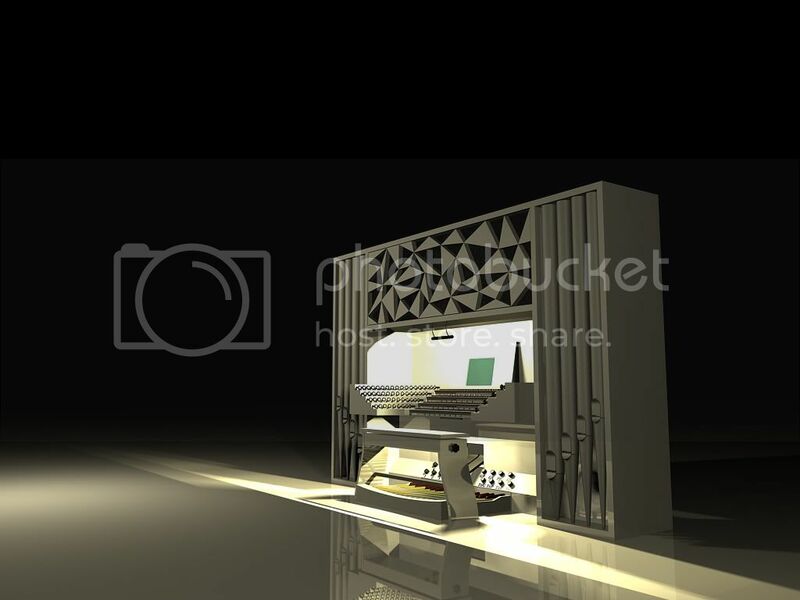 We preferred the sound image of the Vollenhove organ, having an optimal balance between direct sound and hall. The last organ we heared and played, was the modern and universal Litomysl organ, dry sampled by Jiri Zurek. The sound proved to be optimal with the addition of only a small amount of reverb, produced by the Roland/Rodgers RSS-303 quadrophonic hall system. It is really an incredible sensation to play these large virtual organs, on a Cavaillé Coll-like console, simulating a perfect mechanical feeling, visual and auditive ambiance. Upcoming Saturday, interested organists will have the last chance to play on this really outstanding instrument. Also from this place, we thank Joerg and his wife for having us, and wish them a lot of musical satisfaction with this great organ! The green bit on the music stand is actually a piece of glass such that an LCD monitor can be installed behind, "inside" the music stand. Recently I pointed out, that I plan to arrange organ recitals at home. On Saturday, the 7th of June, 2008 there will be a recital for theatre organ with the sample-set 3/11 of Keymedia Productions by Mr. Bernd Wurzenrainer, Solingen. The concert will start at 7.30 p.m. Details will follow. On Saturday, the 6th of September, 2008 there will be an organ recital by using several sample-sets by Mr. Stefan Kießling, Leipzig. Details will follow. I would like to invite all people who are interested in, but because for lack of space the number of participants will be limited up to 20 people. For being able to plan the event I kindly ask you to apply for the visit by email: joerg[dot]glebe[at]thyssenkrupp[dot]com. That sounds exciting Joerg, do you have any plans to record the concert?